Terminalia has been running since 2011 always on 23 Feb. 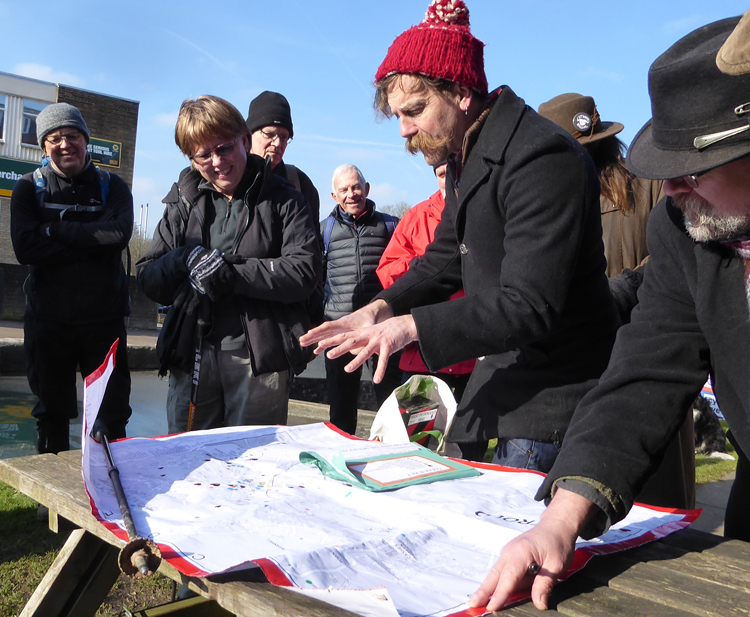 The folks at Radical Stroud have a walk planned for Stroud involving three very different interactions with boundaries and landmarks: spatial, temporal and linguistic. 1. Meet at the Upper Lockkeeper’s Café at 10am when Jon Seagrave will explain how the shadowy operatives of Stroud & District Psychogeography and Deep Topography Commission are attempting a 'subjective remapping' of the town, asking for YOUR assistance in locating the unseen energies that shape and guide our everyday actions here in the bosom of the Five Valleys. Where did YOU have your first kiss? Where do YOU go when you want tranquillity, or fancy a fist-fight? Help identify Aggression Hotpots, Enlightenment Nodes and Knee-Trembler Clusters! Ritual Pilgrimages and Fertility Dances may result! 2. Robin Treefellow will take us on a guided walk to Woodchester Roman Villa where we will slip through all manner of wormholes of Time. Robin Treefellow will also talk of the two names of this barrow: The Toots and the Blacklow – it was the site of the old Saxon hundred moot called Blacklow Hundred. Folk still like to gather there! We will finish with a toast to Faunus. Please bring food and drink to share....And so to home. A walking tour of time, place and the city! On Friday the 23rd of February, members from the walking group Walking with The Waste Land and their friends will be conducting a walk from the Sportsman Car Park in Seasalter, near Whitstable, in Kent. We will meet at 11a.m. in order to catch the low tide at 11.47. On this walk we will walk to "Mick’s post" from here we will experiment with some low tide mud walking, using knots in ropes to record the experience. We will then return to Mick’s post where where we will tie the knotted ropes to Mick’s post in a symbolic ritual of the celebration of Terminus. In honour of Terminalia, Ruth and you will be walking around the walls of Colchester town in Essex - the oldest and longest town wall still surviving in Britain today, 'beating the bounds' and taking in the breathtaking views of the town and its environs. Colchester prides itself on being the oldest recorded town in Britain. The Roman wall is home to some of the rarest mosses and lichens and if you look really hard you may even find one of the remaining ammonite fossils in the wall. Odd finds such as the slice of wall sitting beside pizza place all add to the curiosity of this ancient structure. While the walls are no longer visible, their route is easy to trace. 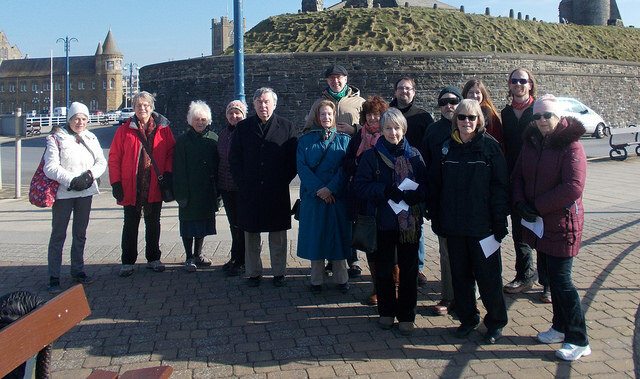 There were gates at Heol Y Bont, Great Darkgate Street, Eastgate and Pier Street, which will be noted as part of the tour. Meet at 1pm, Castle Point (at the sea wall). The tour takes less than 30 minutes. This year we will travel clockwise, in opposition to last year. More details about the walk. Some words of wisdom are available, that enthusiasts might read in advance. Organised by Roger Boyle. Bernardo is leading a cicular walk around the area of Barletta Castle in Apulia, Italy. The walk will also be documented by Bernardo on smartphone. This walk should last one hour and departs from the castle. For more details and to attend, please visit the Walk Castle page. A slightly different format to past years, we will find, in addition to the medieval stones, our own boundary markers of the city. 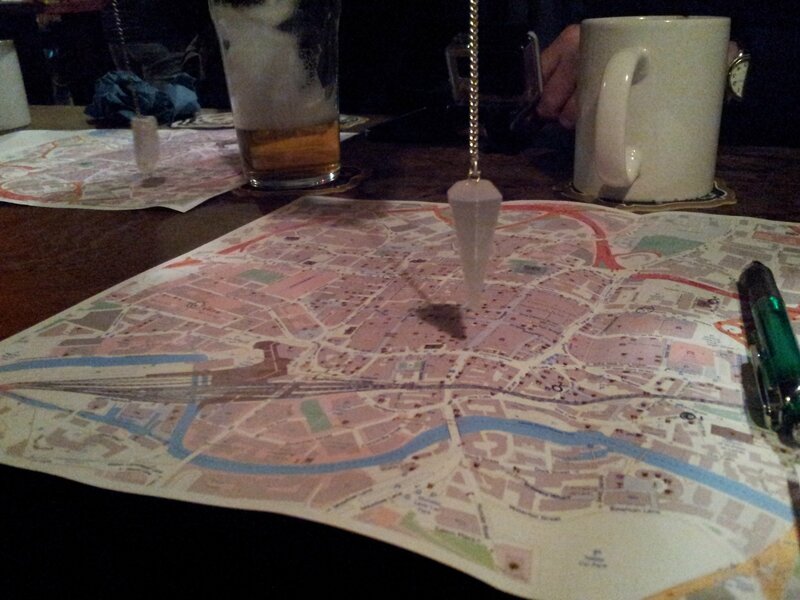 Using crystal dowsing techniques over maps in the bar beforehand participants will plot out a route to follow within the city centre. Walkers will then head out to explore the divined places and examine whats there and uncover boundary indicators. Once done (or after a set amount of time), examining our new boundary markers and the map, we will head inwards to find the centre. At each newly found marker, we shall celebrate the boundary with snacks, drinks and flowers, do please bring some to share! 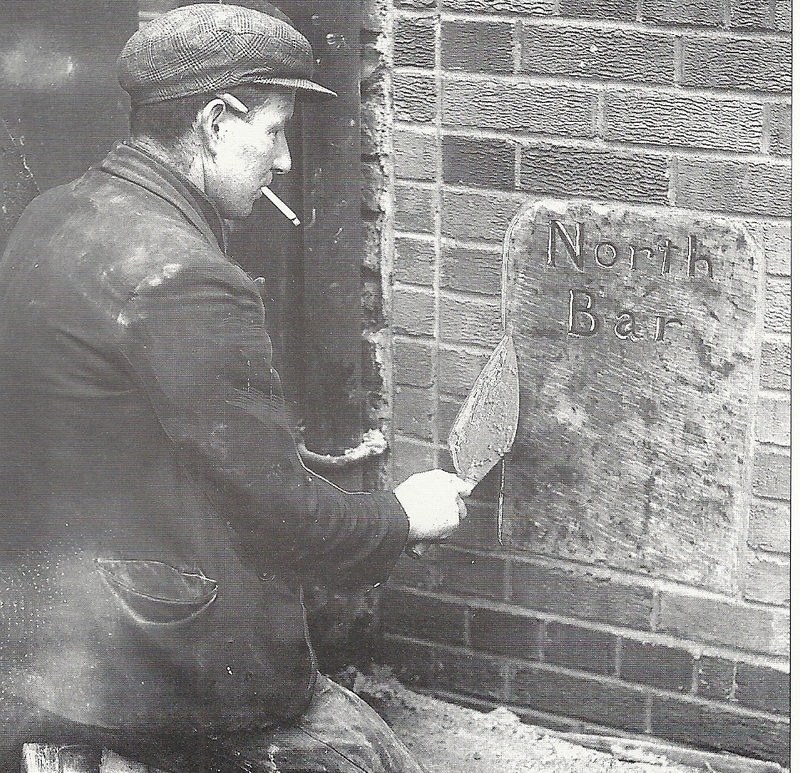 We're happy to report that 2018 finds all the medieval boundary markers of Leeds, the bars, marked with blue plaques and/or uncovered. Our actions over the years has been successful! 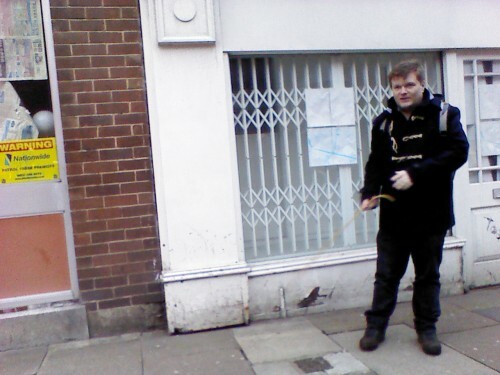 This year we will seek in addition to explore the city by finding new boundary places. 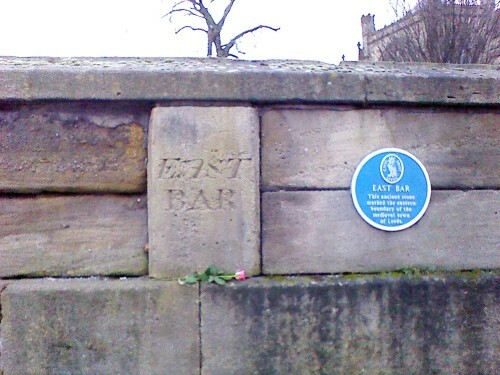 The medieval boundary stones marked out the limits of the medieval city, and the entrances and toll booths for animals and trade. Terminus is also the god of non physical boundaries such as time and seasons and relationships. 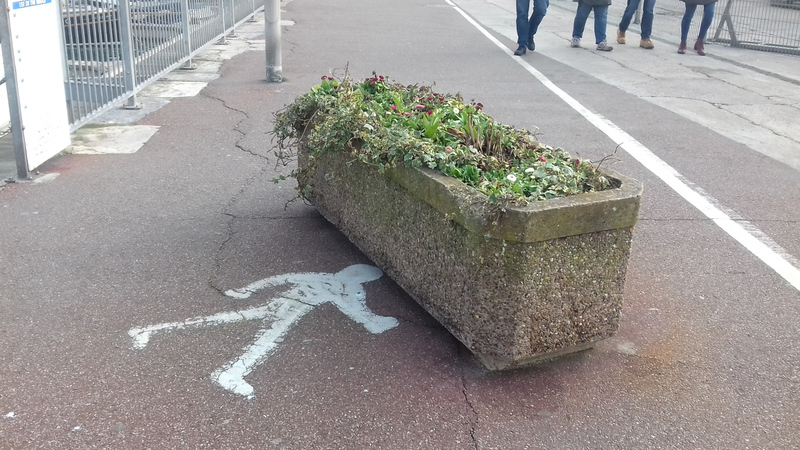 How has the city changed from ancient times - can we ask our unconcious minds where these new marks would or should be? 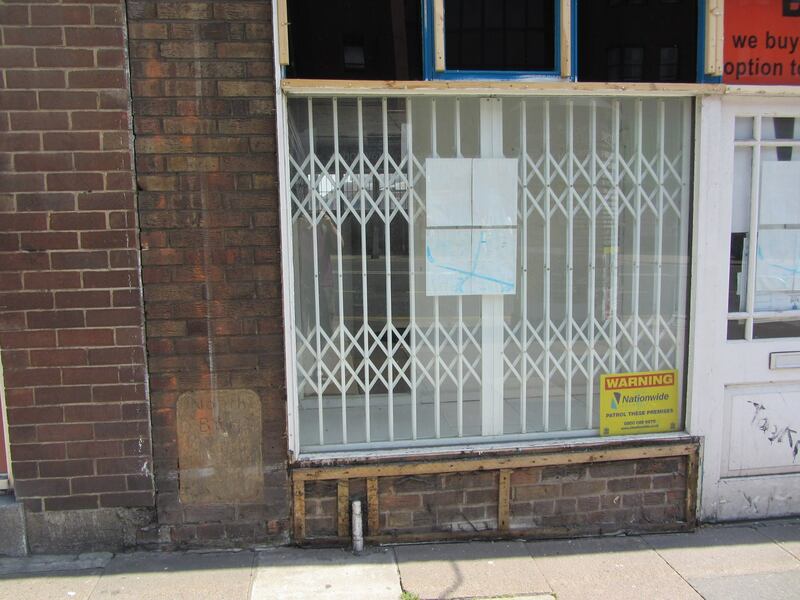 Simon Bradley will perform a guided tour of his "Pocket Museum of Displacements" at a location along the walk. 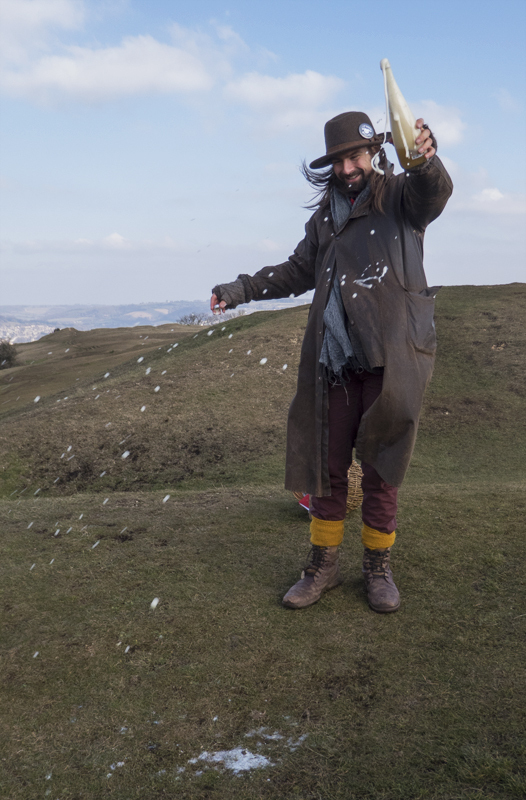 Anzir Boodoo will perform a traditional Roman blessing at a suitable spot along the walk - possibly including an invocation to a Roman river god. 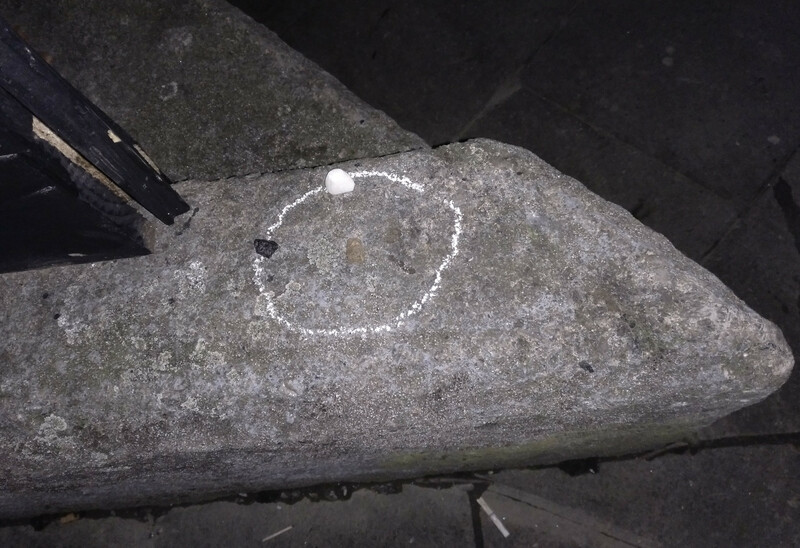 Meet 5.30pm at Wharf Chambers bar to be part of the essential dowsing, divination and route planning activity. We will leave the bar at 6pm sharp. Event is free, just turn up. Tickets would be nice, they are not required but help us plan numbers. 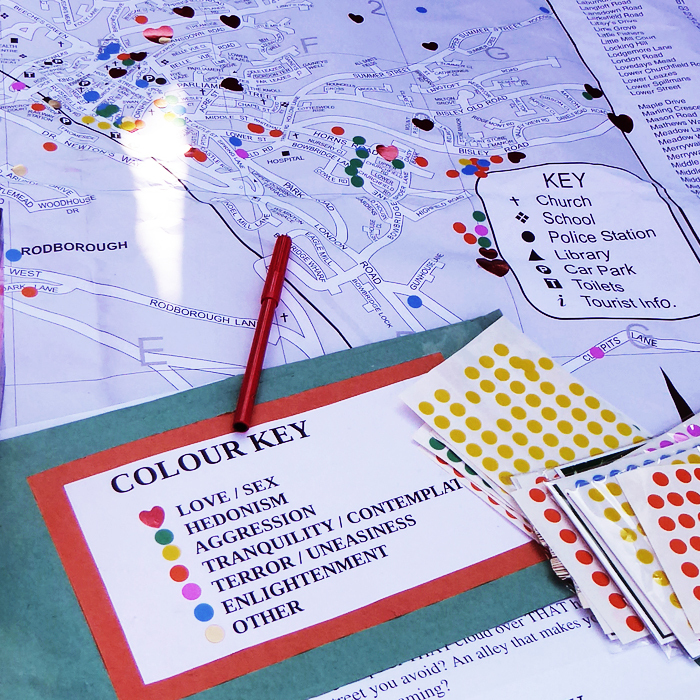 Tapping Into The City looks at our movements through private-public space in the city, the impact of urban surroundings on us and our relations with each other. 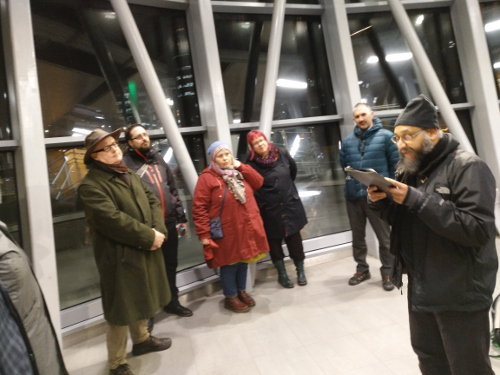 Come and join in this live art piece - a group walk around Stratford - one of London's most overtly regenerated areas and centres of privatised-public space (Westfield Stratford City, Queen Elizabeth Olympic Park and East Village are all within walking distance). Friday 23rd February, 6.30pm. 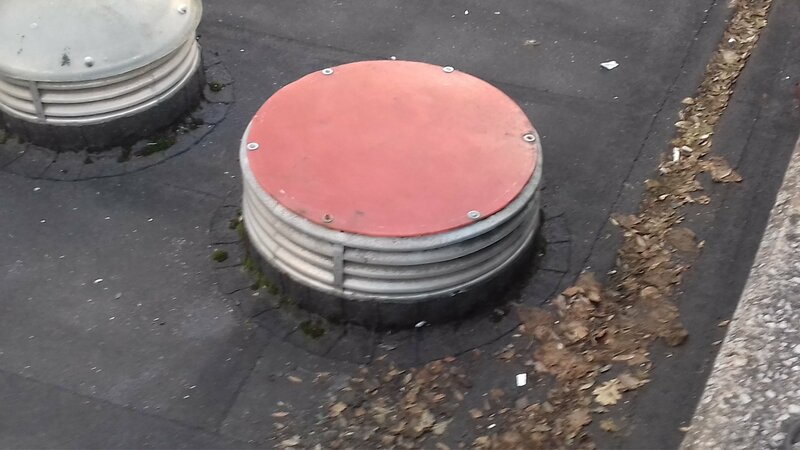 Meeting point - at the bottom of the Meridian Steps (the stairs leading up to Westfield, next to the bus and underground station and opposite Stratford Centre). Nathania will explain the piece and then we'll walk together for an hour or so, simply moving as one through the city space, listening to its sound and the sound of our feet. 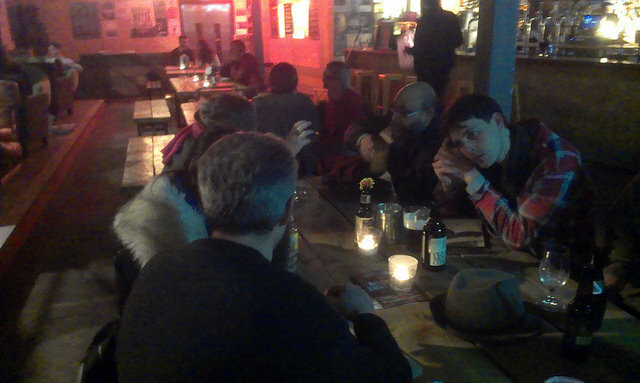 Afterwards we can retreat to a warm pub nearby. Ideally we'll wear shoes with pennies stuck to the soles. 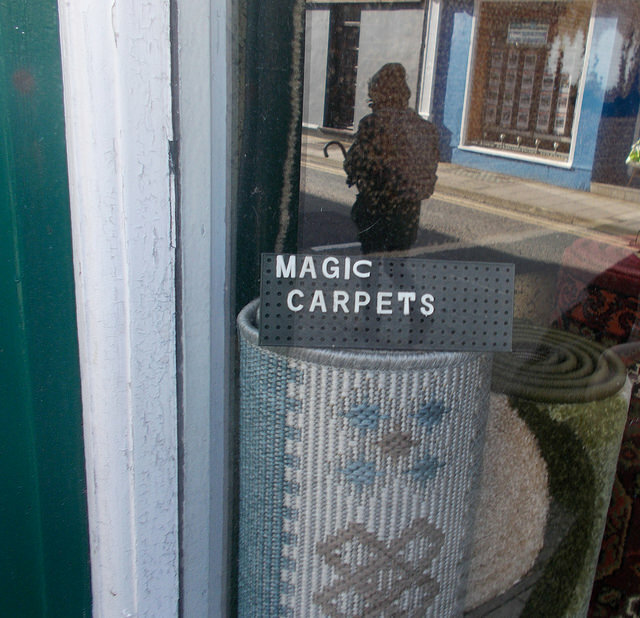 It's Terminalia Festival of Psychogeography, so after years of informally exploring and documenting Dalston, Hackney Tours is pairing up with cult Ridley Road gallery space Doomed to host another Hackney Tours Wonder Wander in this fascinating and culturally rich area. 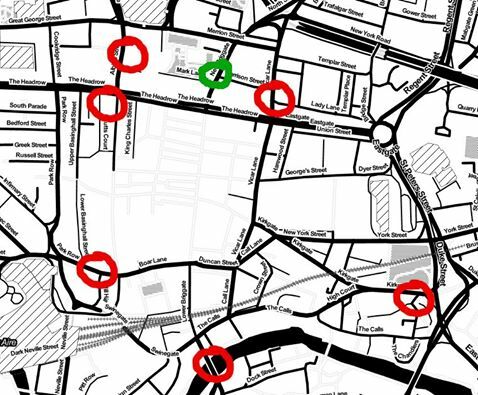 Hackney Tours has been combing the borough since 2009 and recording the results (see here for examples) while Doomed have been running deliberately non-commericial shows with a strong photography element and hosting alternative free education sessions by arts academics. 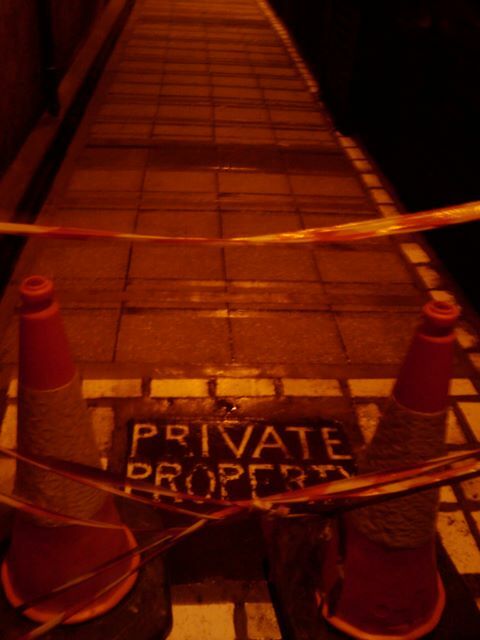 Dust off your Debord and let's take our very own Dérive (Drift) – making our own fun as we explore the backstreets and create our own psychogeographical work. Don't be intimidated by any of the big French words, it's really just about being open and receptive to what's around you and taking a moment to stop and smell the flowers. That's what I call a 'wonder wander'. Your opinion and thoughts about what you see and experience are what's important, not what a textbook says. We might make some amateur maps, take some photos, or create a narrative. It's not rocket science - but it is fun! Organized by Hackney Tours in collaboration with Doomed Gallery Dalston . NEW Read Ursula's Terminalia 2018 blog post. Simon Bradley, Leeds. Pocket Museum. 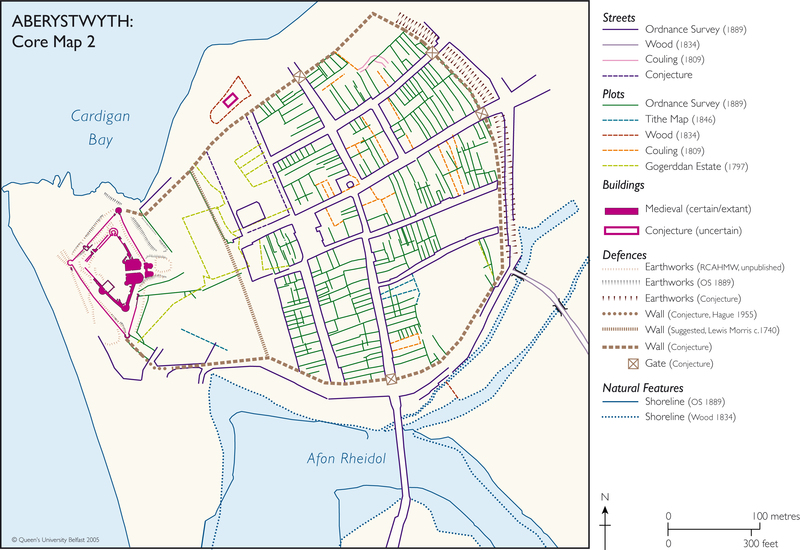 There were gates at Heol Y Bont, Great Darkgate Street, Eastgate and Pier Street, which will be noted as part of the tour. Meet at 11am, Castle Point (at the sea wall). More details about the walk. Organised by Roger Boyle. 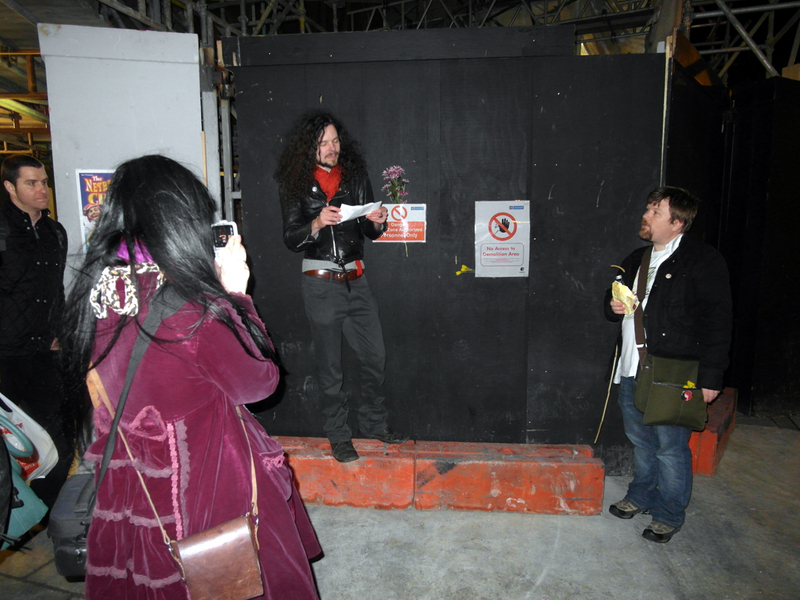 11am, London, Vauxhall Bus Station: Exploring Boundaries and Monuments. We will be walking at 11.00 am from Vauxhall bus station to Waterloo station via Tate Britain, the site of Mark Wallinger's, "State Britain" in 2007. We will then follow an exploratory walk to Trafalgar Square and on to St Paul’s , ending at Waterloo Station. This should take a couple of hours allowing for a tea or coffee break en route. 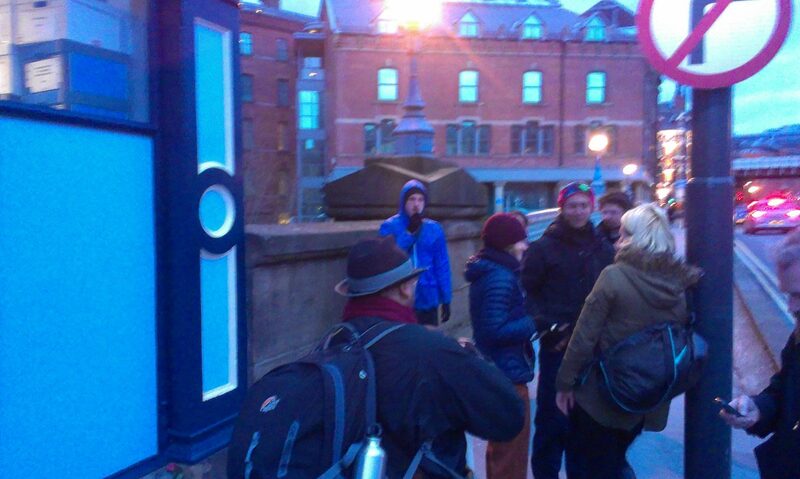 In recognition of Terminus this walk will focus on exploring the memorials and statues along the trajectory. We will observe how and what we choose to commemorate and celebrate through our public spaces. 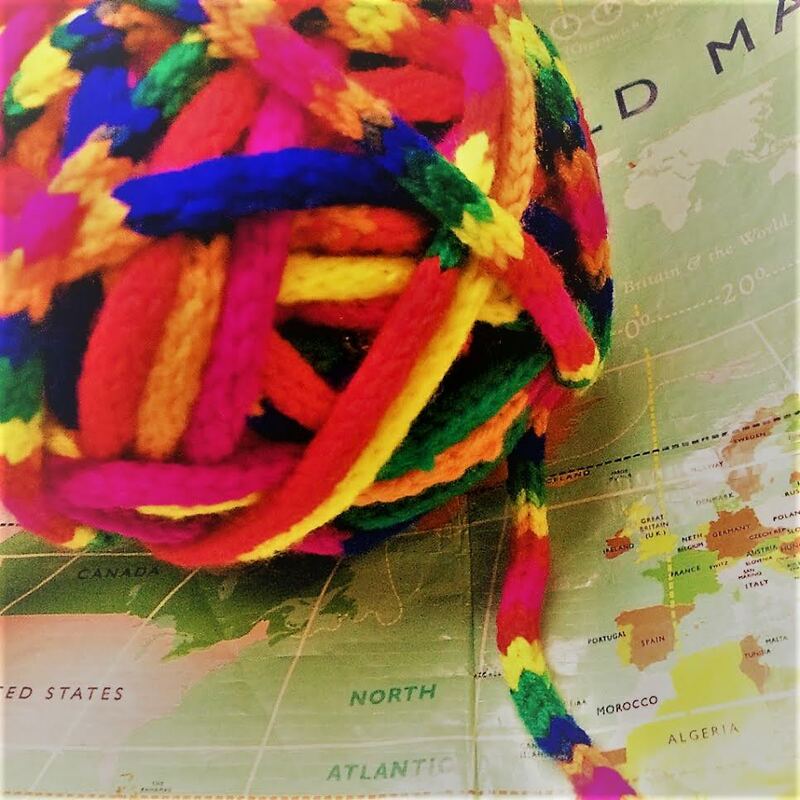 Each participant in the walk will receive a hand made rope which they can make knots in to record the experience of the walk. Free. 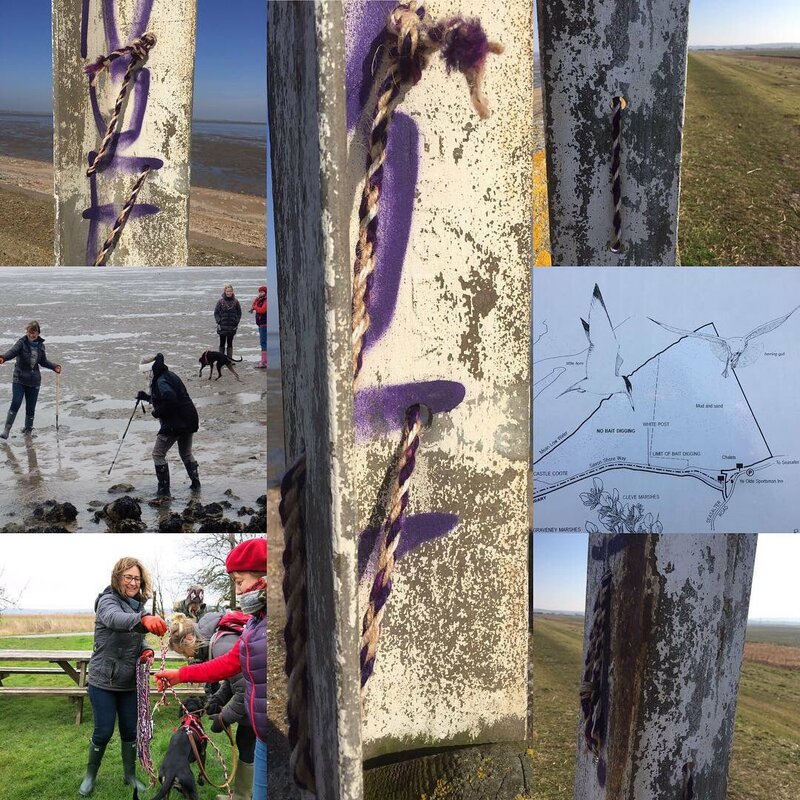 There is a also a follow up walk on 25th Feb in Seasalter, Kent(PDF) to Micks Post. For further details and if you would like to attend please contact Elspeth Penfold elspethpenfold@yahoo.co.uk and have a look at the pdf for this event. Women Who Walk Network members, friends and curious passersby are invited to take a dérive to celebrate the festival of Terminalia. In a tribute to the borderless and liminal, this synchronised walk links to the wider Terminalia Festival. Dérive as you like it – try one of these provocations or just follow your curiosity: 1. Walk with friends, family or colleagues. Seek synchronicity. Discuss your findings. 2. Disobey signage. Defy walls and boundaries. Walk in a straight line as far as you can. 3. Incorporate a catapult. Flip a coin at junctions. Follow your nose, or a noise, or an annoyance. Then share your experiences with fellow celebrants: For instant sharing, tweet while you walk. Upload thoughts, findings or images to @womenwhowalknet so Sonia can retweet them. 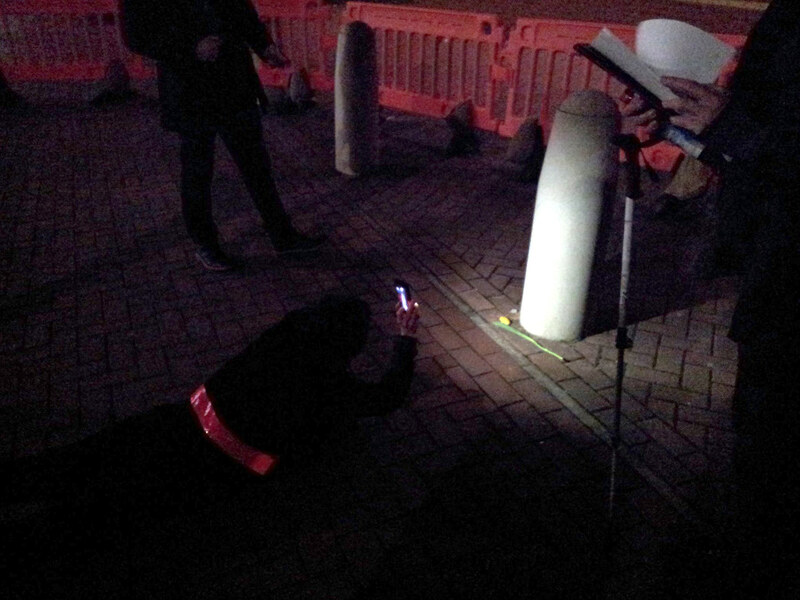 Use #terminalia to follow the synchronised walk on Twitter and add your comments. For a more leisurely response, post your walking notes, comments or blog link to the network website. This event has been replaced by a ritual event called Rahmat Ali Chaudhry Urs Mubarak at 5pm in Cambridge. See below for full listing. 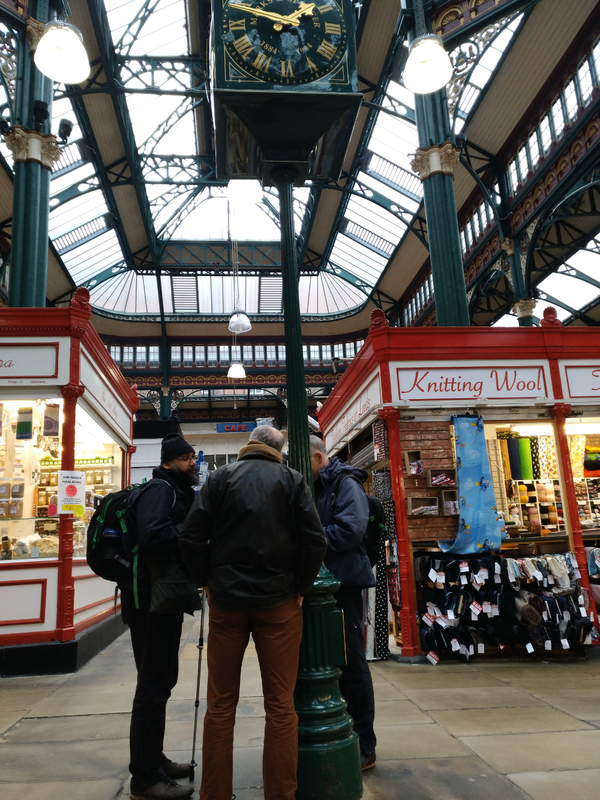 Prepare for the Beating the Bounds walk by exploring the spatial and temporal limits of a lunchtime at Kirkgate Market, Leeds. Meet at 12.40 by the M&S clock, in the 1904 hall for a crowd-sourced tour of the largest covered market in Europe. Following our noses for around 25 mins we'll create a spontaneous platter map of vernacular gastronomy and then sit down to destroy it with our teeth and taste buds. 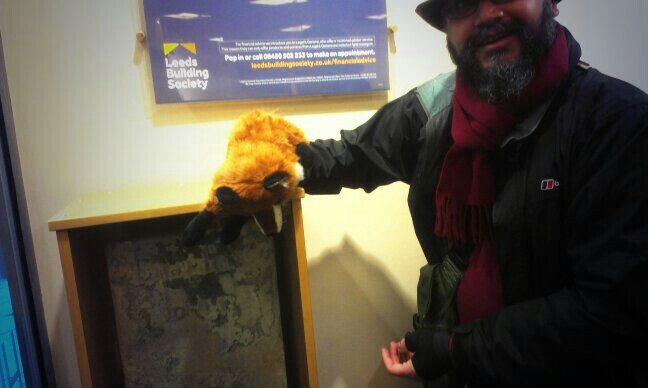 (Funded by the WLT small grants foundation. This tour was first conceived with Katie Etheridge and Simon Persighetti's for their 'Personal Shopper' project, Compass Festival 2016) By: @wkrslunchtime. Event is free but tickets are required. Inspired by Hayley Alessi's experiences of visits to the market as a small child, and other interactions with markets over the years. The tour explores peoples’ connections to the market and to each other, and shows why markets are an important part of our social history. 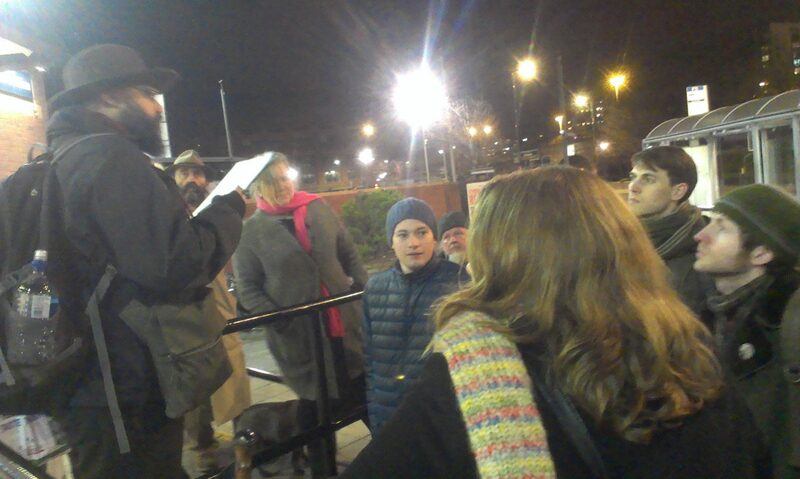 The walk reimagines the market through Hayley's personal stories and experiences, and invites the participants to share some of their own along the way. To do this she has a ball of thread, which she will unravel as we walk, and tie knots in to remember each story as it unfolds. Meet at the M & S Clock in the 1904 hall. The walk last approximately 40 mins. A ritual celebration at the shrine of Rahmat Ali Chaudhry in Cambridge. "Inqalabi Communist InterNatIonal (ICINI), All LaBour Industrial uniON (ALBION), Leave the EU Leave the UK Leave NATO, And join DINIA, Psychogeographical hyper Urs Mubarak, Down with ISIS ISI SIS Down with all destructive workers power over reproductive workers. 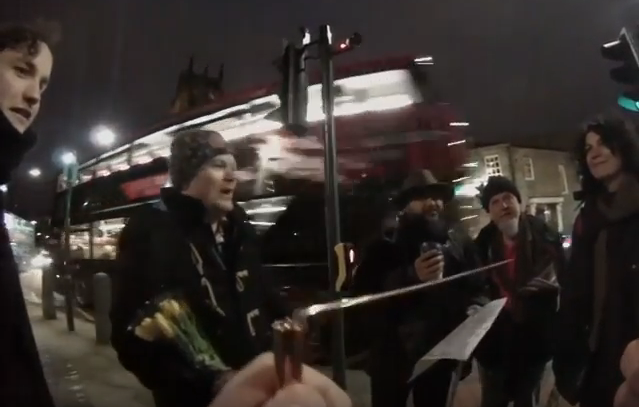 Towards REproductiVe wOrkers and Labourers indUsTrial unION"
5.55pm Leeds, Central Road: "Centered: Threshold / Hearth"
David Bollinger will spark off the Beating the Bounds walk with a short ritual sacrifice to the other Goddess of Psychogeography: Vesta. Vesta (or Hestia as the Greeks called her) is the goddess of liminal spaces, thresholds and hearths. Her place was the fireplace, the central hearth in every home. As another boundary entity she was responsible for the centre and thresholds, the boundary between spaces (Hermes is the god of travelling across boundaries and you know about Terminus). Sacrifices to this domestic, very early primitive goddess was often seen as being done for no reward, literally "going up in smoke." 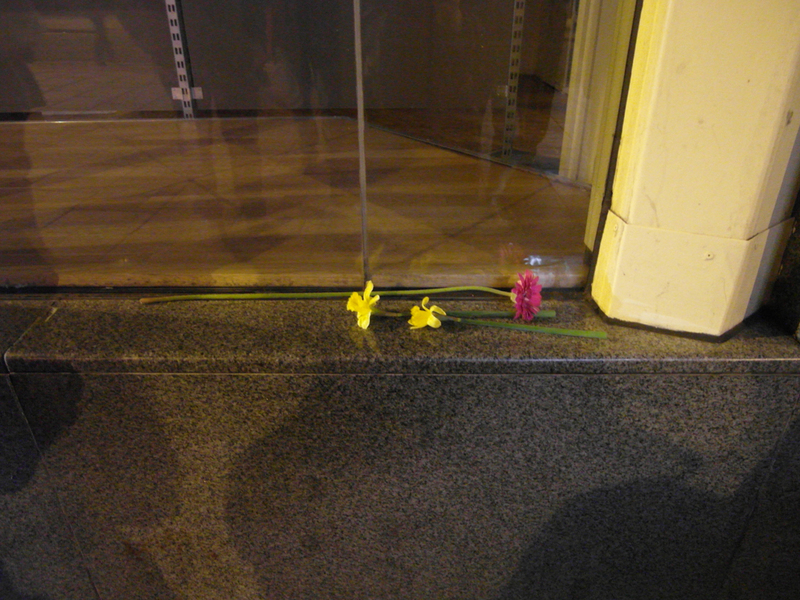 Please meet in Central Road, Leeds opposite Little Tokyo. This is a very short event (5 mins). 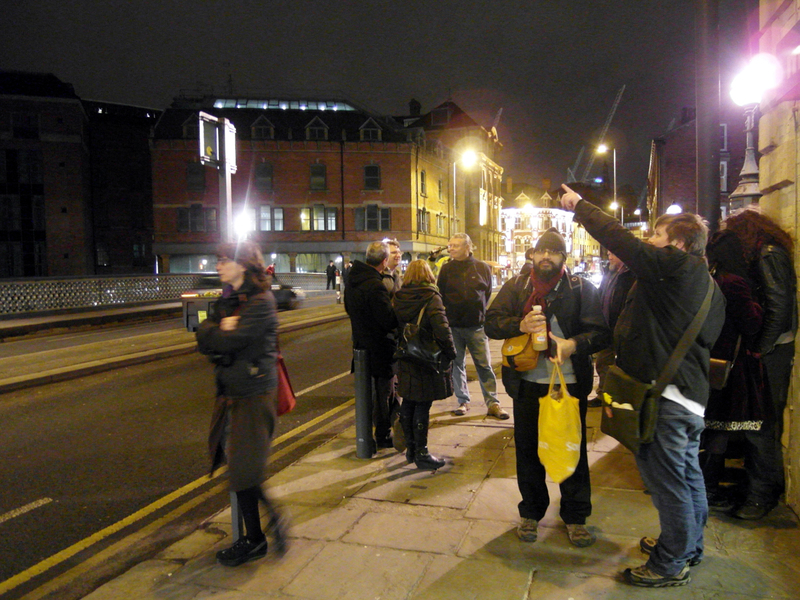 6pm Leeds, Central Road: Beating the Bounds - Circular walk around medieval boundary of Leeds. 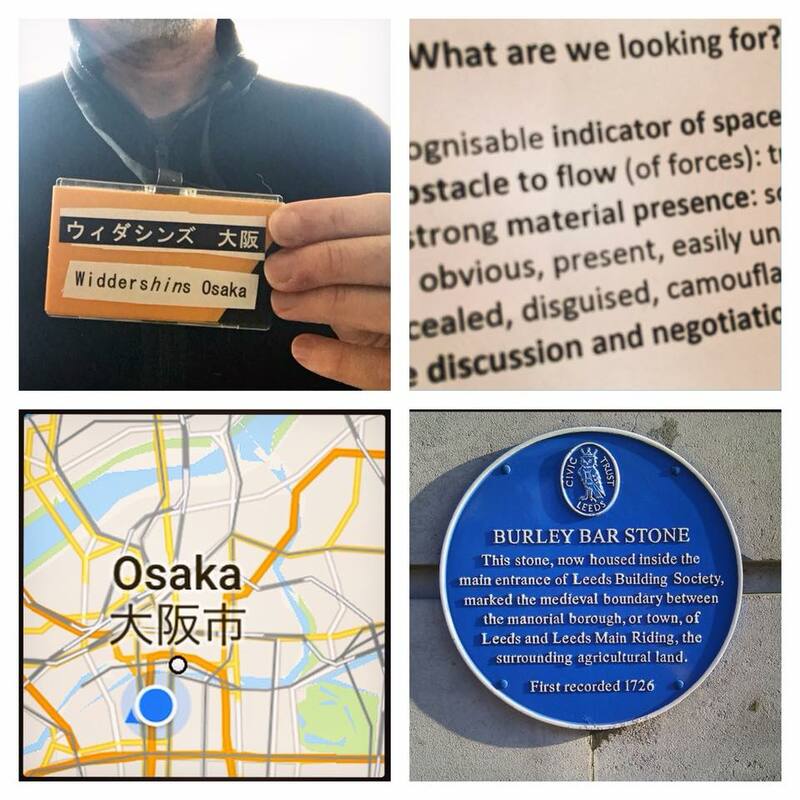 We will be walking widdershins (anti-clockwise) around the city, visiting the ancient boundary markers that defined the medieval boundaries of the city. Traditionally, feasting and dances were performed during Terminalia at boundary markers, and we will do the same with things with cake, flowers and a drink! The boundary markers around Leeds are called bars (gates, possibly that barred off an entrance) and mark the borders where the city ended and the countryside began. Some stone markers still exist. 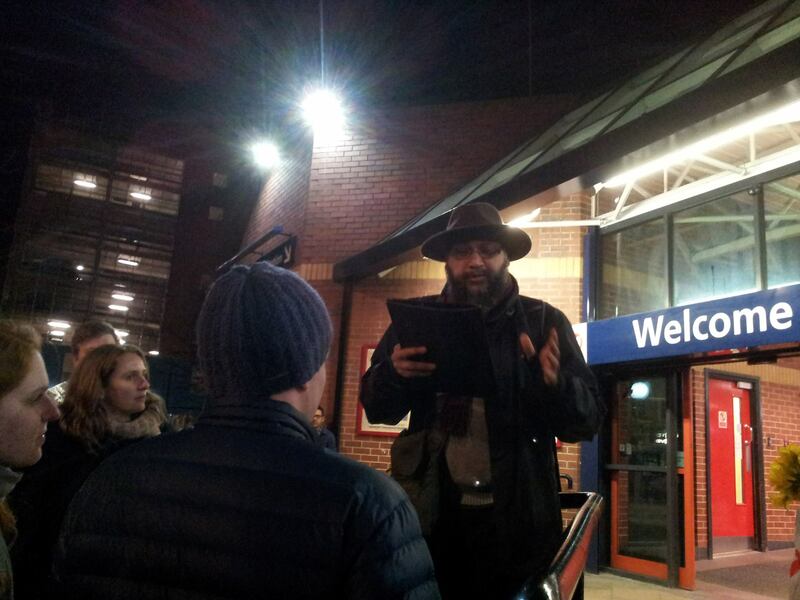 Anzir Boodoo will perform a traditional Roman blessing at the city's transport termini. The walk may also visit the new glittering southern entrance to the railway station where an invocation to a Roman river god will be enacted as we stand over the water. Event is free, just turn up. Tickets are not required but help plan for numbers. 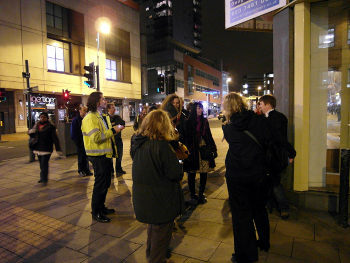 Come and join in this live art piece/group walk through the city, starting at Regent's Place. Nathania will explain the piece and then we'll walk together for an hour or so. Afterwards we can retreat to a warm pub nearby. No need for expertise, to practice or to perform - we will simply explore and respond to our surroundings and each other by moving as one through the city space and listening to its sound and the sound of our feet. 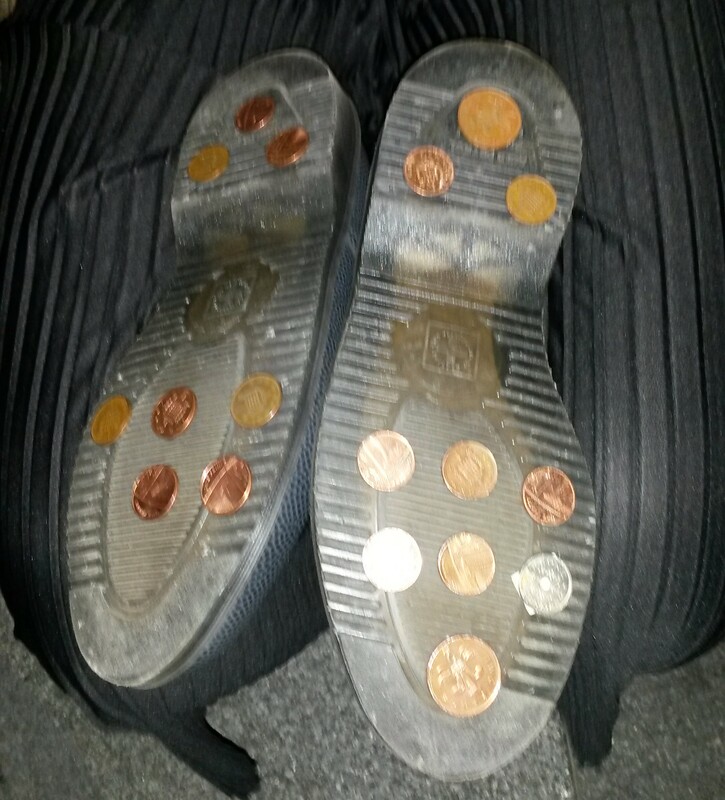 Ideally we'll wear shoes with pennies stuck to the soles. Free. 6.30pm. 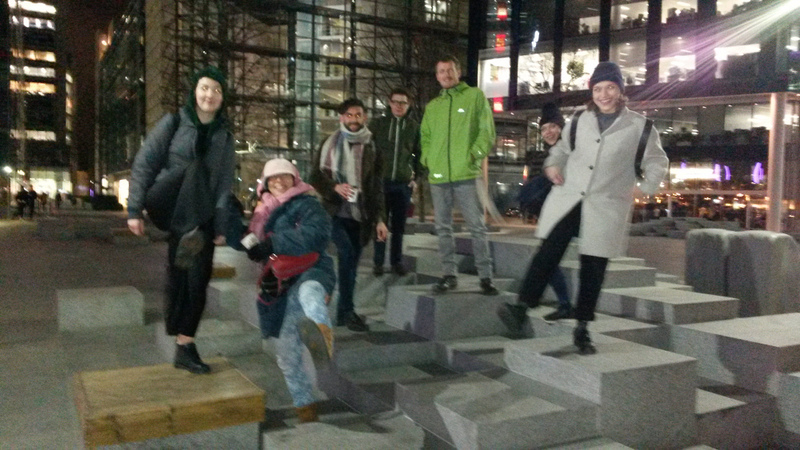 Meet at Regent's Place Plaza, at the seating blocks closest to Euston Tower. 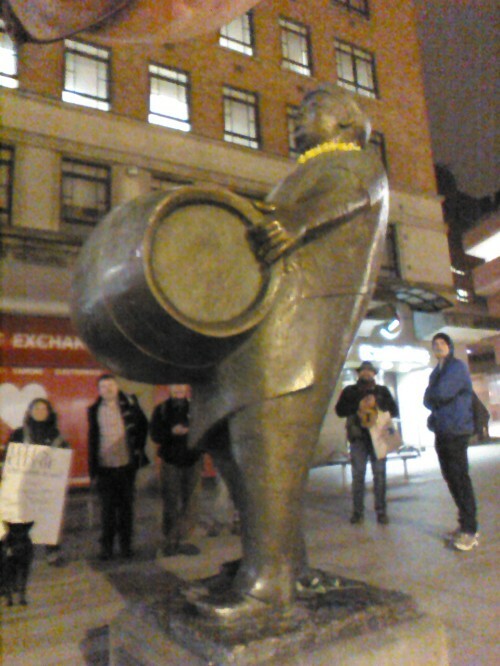 Closest tube - Warren Street. An image taken in Cork, Ireland by @everydayaesthletics on Instagram as part of the Women Who Walk event. 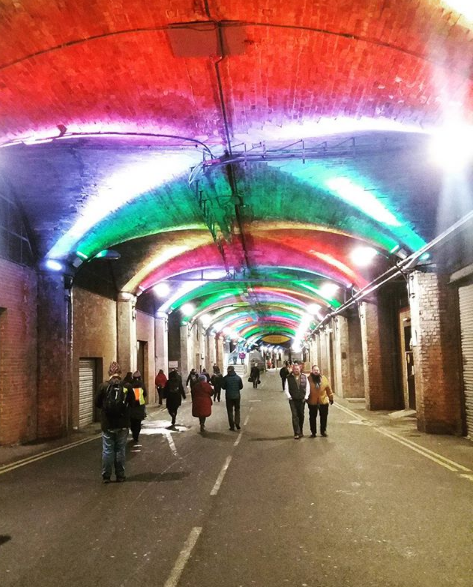 The Dark Arches, taken by @susan_loves_leeds during the Leeds Beating the Bounds walk. 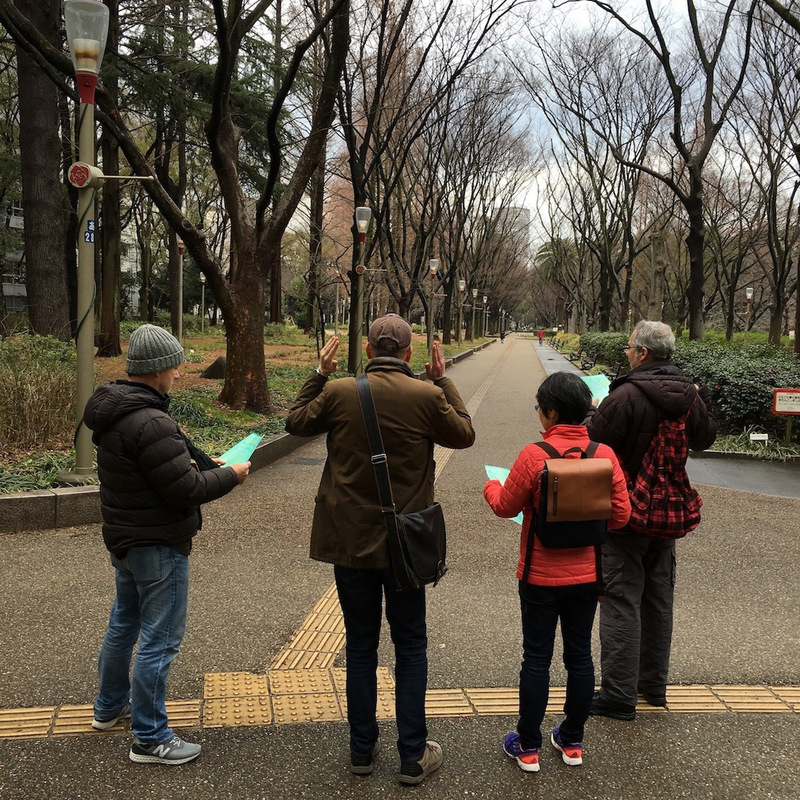 Utsubo Park, Osaka, with Gareth Morris Jones during his Alert Reveries walk in Osaka, Japan. 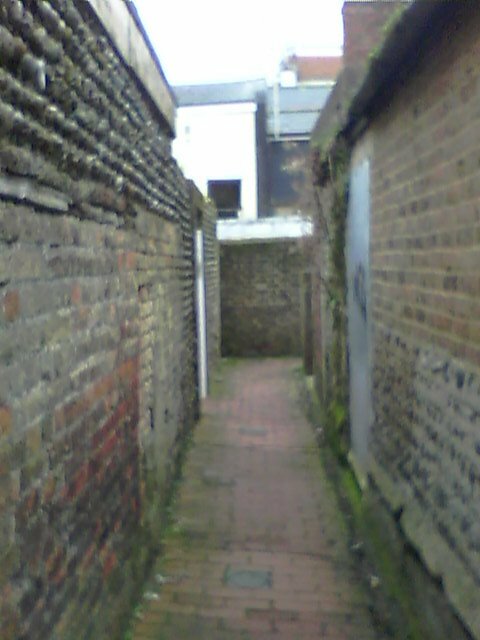 Twitterns in a Sussex Town by Pynchon in Public. * Leeds - Terminalia Turbo Dérive 3pm. Central Leeds. 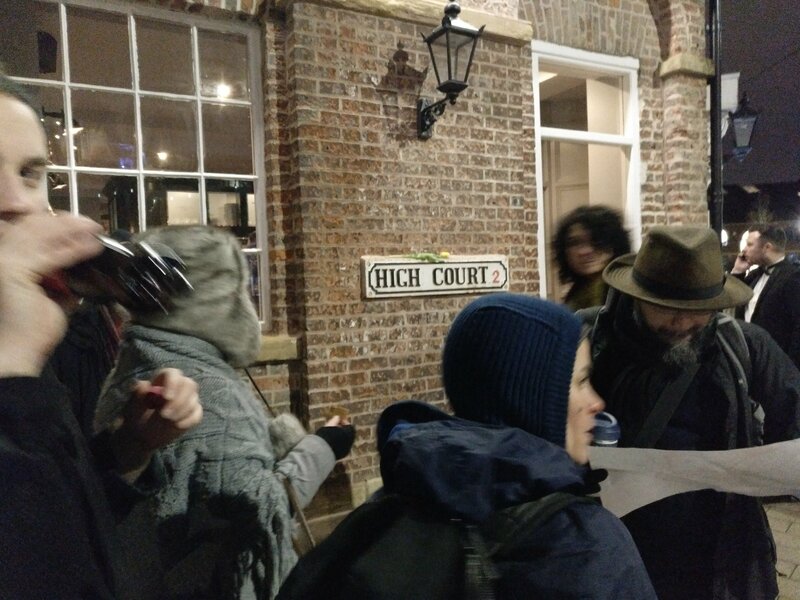 Sound artist Phill Harding will lead a silent walk of rapid passage and high velocity through central Leeds following a dynamic algorithmically derived route. 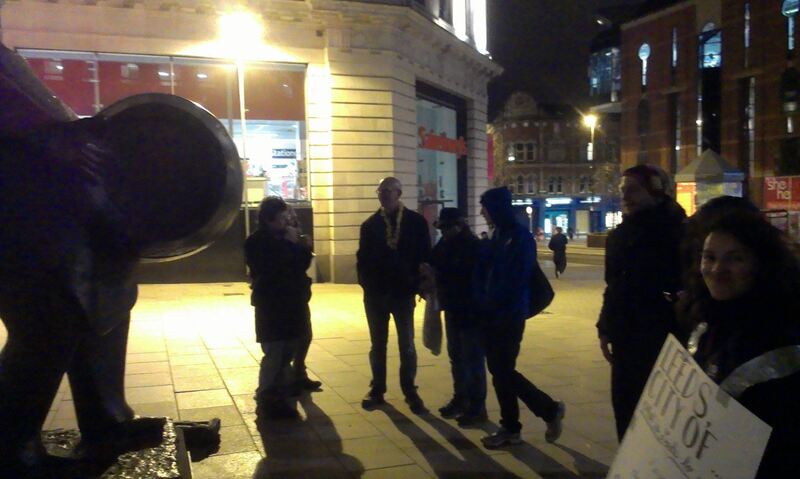 * Leeds - Beating the Bounds 6pm eeting in The North Bar Pub, North Street, then around the city. Free. 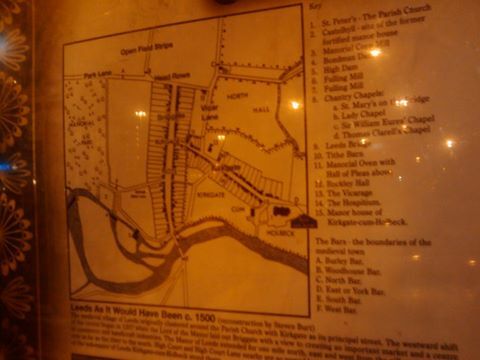 Leeds - Beating the Bounds - Circular walk around medieval boundary of Leeds. Bring treats to share, flowers to leave and drinks to keep you warm! With events, interventions, and special performances from local artists. More details coming soon. 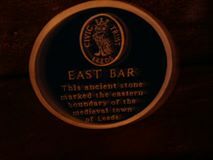 We will be walking in an clockwise direction around the city, visiting the ancient boundary stone markers that defined the medieval boundaries of the city. Traditionally, feasting and sacrifices were performed during Terminalia at boundary markers, and we will do the same with things like poetry, cake, flowers or a drink! The boundary markers around Leeds are called bars (gates, possibly that barred off an entrance) and mark the borders where the city ended and the countryside began. Most are recorded and some still exist. A special Displacement Activities intervention involving the group participating in a sonic boundary ritual will occur at some undisclosed part of the walk. 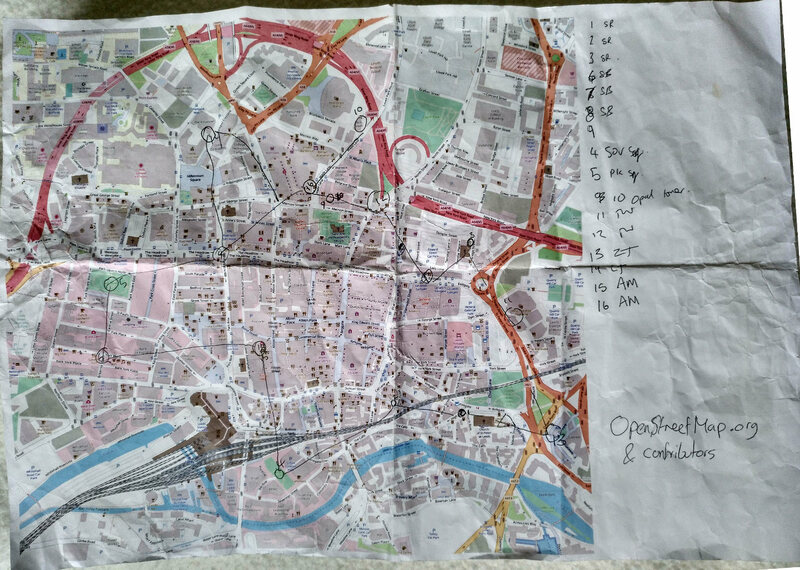 This year our walk will include the opportunity to contribute to a new map of the city which will endeavor to contain some of our thoughts, feelings, memories and insights about the experience of Leeds. Liz Cable, Senior Lecturer in Digital Narratives at Leeds Trinity University will collate and curate your responses to the prompts of the city, and your experience of the Festival: photographs, doodles, memories, prose, poetry, sounds, commentary. What memories do we leave behind as as we walk into the new year. What wishes do we have for this city? Our collection will be mapped onto the city using augmented reality and available for download and re-experience as a mobile app. 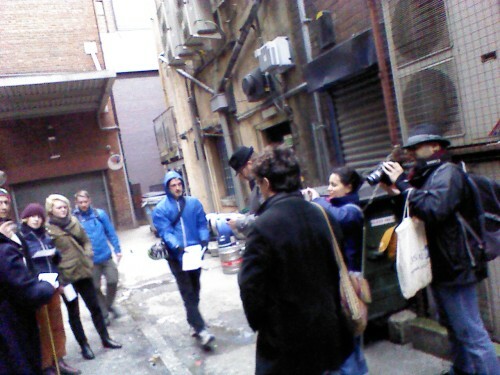 * Symposium – Taking it to the Streets: Empowering Interactions with the Urban Environment 6pm-7.15pm. Business and Law building, Edge Hill University, Ormskirk. Free. 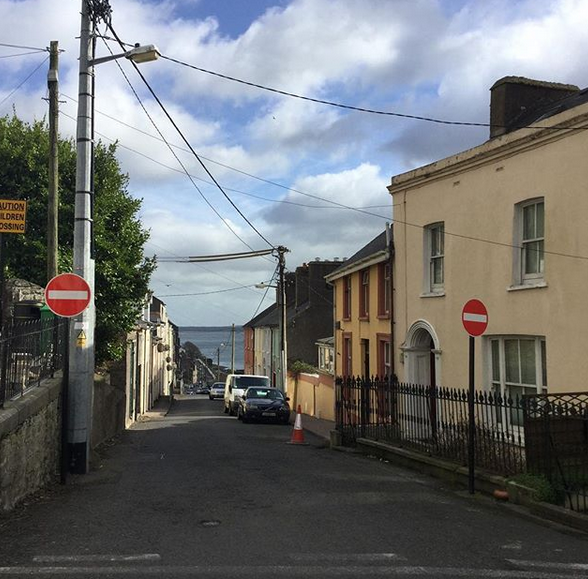 This symposium explores the concept of psychogeography, the practice of attentive walking used by a diverse range of writers, activists, artists and performers. With talks by Dr Andrea Capstick, Morag Rose, and Phil Smith. The walkers relax with a pint after the walk. 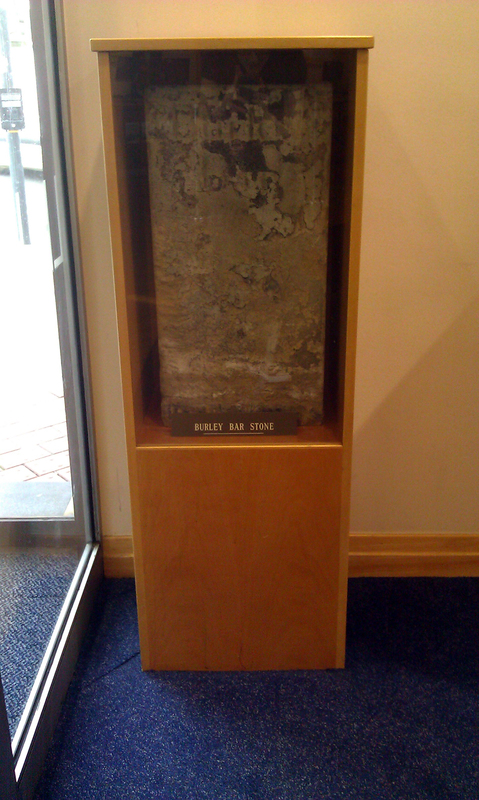 New for this year, the North Bar Stone has been discovered! We will be walking in an anti-clockwise direction (widdershins) this year around the city, visiting the ancient boundary markers that defined the medieval boundaries of the city. Traditionally, feasting and sacrifices were performed during Terminalia at boundary markers, and we will do the same with things like poetry, cake, flowers or a drink. The boundary markers around Leeds are called bars (gates, possibly that barred off an entrance) and mark the borders where the city ended and the countryside began. Most are recorded and some still exist. Bring yourselves, sticks, warm clothes and to share: some cake, drinks and flowers! The North Bar is finally uncovered! 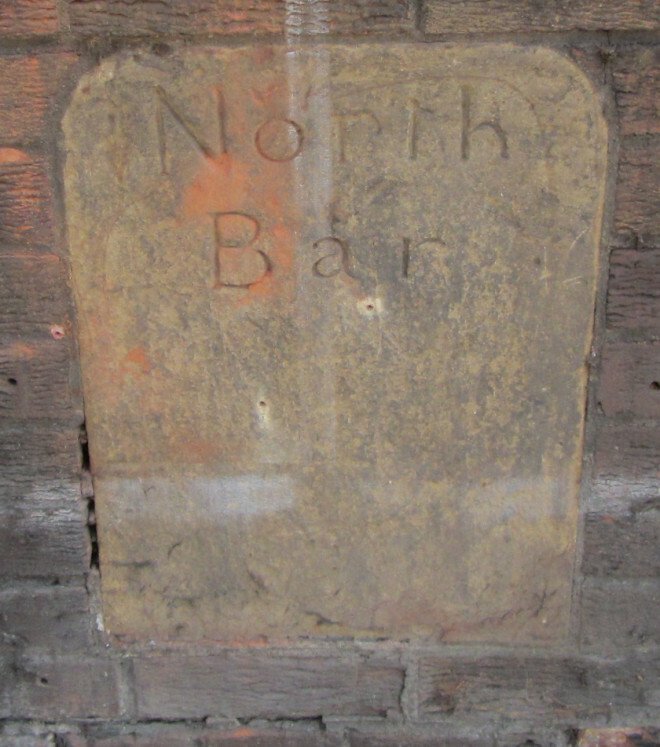 The North Bar sees the air. The East Bar and A Puppeteer and Puppet! 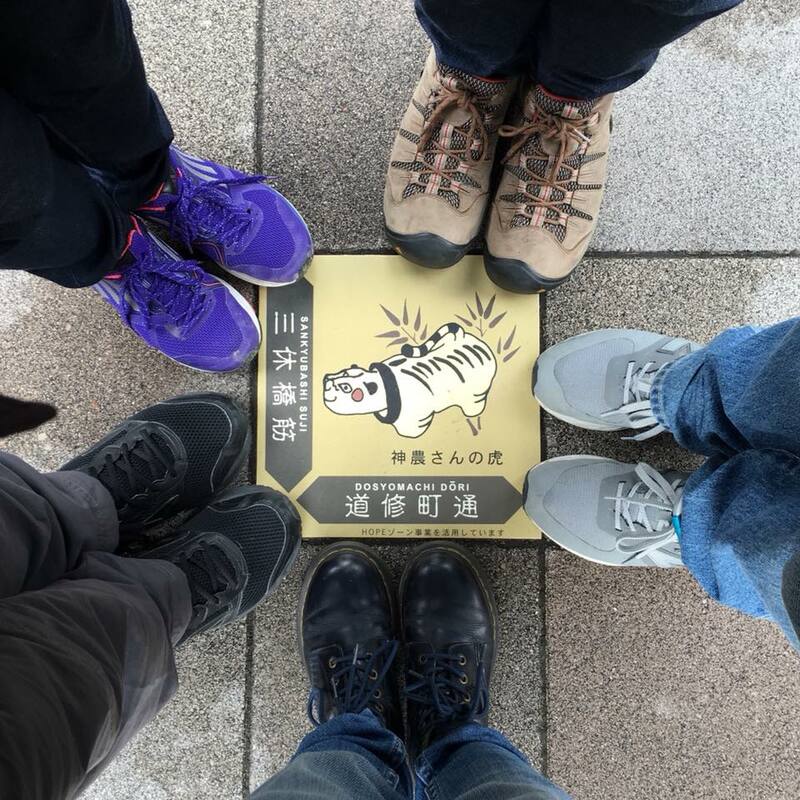 We will be walking in a clockwise direction around the city, visiting the ancient boundary markers that defined the medieval boundaries of the city. Traditionally, feasting and sacrifices were performed during Terminalia at boundary markers, and we will do the same with things like poetry, cake, flowers or a drink! The boundary markers around Leeds are called bars (gates, possibly that barred off an entrance) and mark the borders where the city ended and the countryside began. Most are recorded and some still exist. Meet at 4:00 for a 4:15 departure at the North Bar bar (24 New Briggate) then clockwise to the East Bar by the Parish Church, then onto the South Bar, (Adelphi comfort stop) then to the West Bar, near City Square and onto the Burley Bar (Woodhouse Lane) and completing the circle back at the North Bar for further festivities. Tim indicates where the North Bar is covered up. 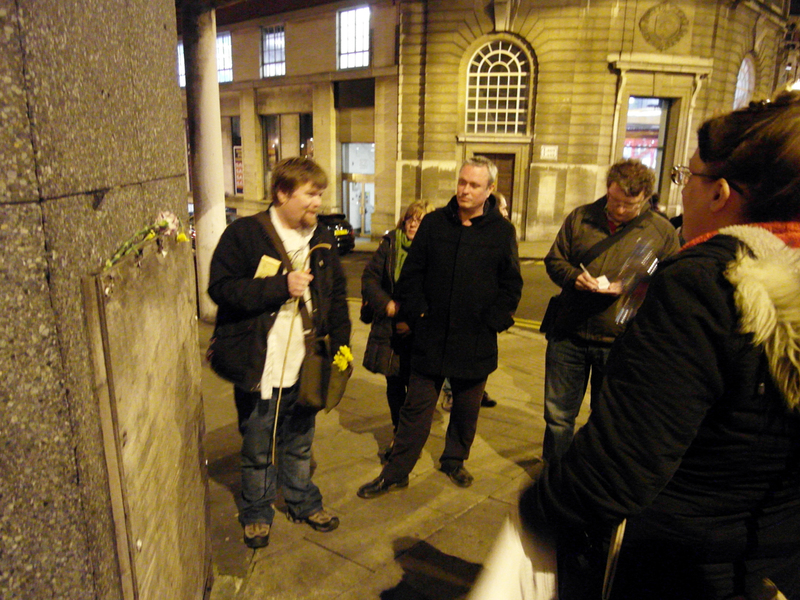 CELEBRATE TERMINALIA - the festival of Terminus - Roman god of boundaries on Saturday 23rd February, 2pm Leeds. We will be walking in a clockwise direction around the city, visiting the ancient boundary markers that defined the medieval boundaries of the city. Traditionally, feasting and sacrifices were performed during Terminalia at boundary markers, and we will do the same with things like poetry, cake, flowers or a drink! The boundary markers around Leeds are called bars (gates, possibly that barred off an entrance) and mark the borders where the city ended and the countryside began. Most are recorded and some still exist. 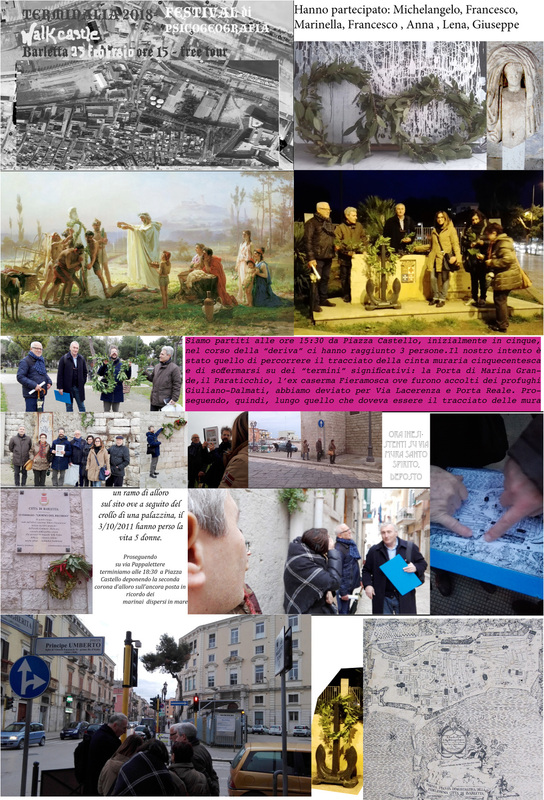 In addition to the historical boundaries that we encounter, you are invited to discover the hidden and not so hidden boundaries and borders that are concrete, social, political or virtual in the city. Meet at 2:00 for a 2:15 departure at the North Bar bar (24 New Briggate) then clockwise to the East Bar by the Parish Church, then onto the South Bar, (Adelphi comfort stop) then to the West Bar, near City Square and onto the Burley Bar (Woodhouse Lane, and should be viewable this year!) and completing the circle back at the North Bar for further festivities. A more exploratory evening walking by a small group.